Thanks to advancements in technology we are soon to experience a new approach to health. It will become safer, more personalized and convenient, and focused on prevention rather than treatment of the disease, explains Christian Schmid, in-house health tech investment specialist at Credit Suisse. Credit Suisse: How does artificial intelligence change the way we think about medical services? Christian Schmid: I think artificial intelligence (AI) is more likely to change the way we think about handling medical data rather than about medical services as such. At the moment we are collecting lots of data from medical and research centers, and also directly from consumers via mobile apps and devices like fitness trackers. If it wasn't for AI, it wouldn't be possible to gather, process and make use of all this health-related data efficiently. Algorithms these days are very advanced, thanks to rapid developments in technology and the huge computing power that is readily available. This makes it possible to process all that input and come up with more powerful output. In turn, this is what will help doctors and patients to closely monitor health journeys. What countries have been most active in making their healthcare systems digital? Countries with high healthcare costs have a much more pressing need for digital solutions. Take the US for example, where about 18% of gross domestic product (GDP) is spent on healthcare. Digital health can increase efficiency and substantially reduce costs. What about the emerging markets? In big countries that have less-developed infrastructure, healthtech has been widely adapted because of the convenience it brings. 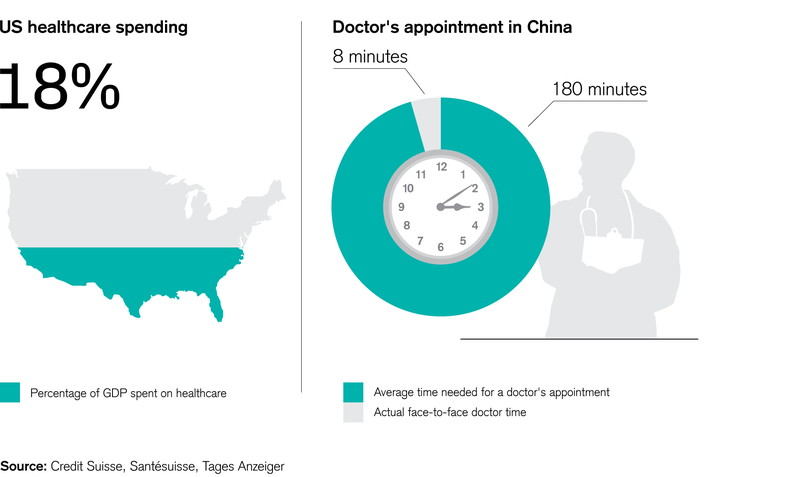 In China, out of the three hours that an average citizen spends on a doctor's appointment, only eight minutes are actually face-to-face doctor time. The remaining 172 is spent phonecalls, commuting, waiting... If all you need is general medical advice or help to interpret a lab test, rather than a physical examination, getting the results online and having a telehealth consultation remotely with a doctor is a very tempting option. Why did it take so long for digital solutions to enter the medical sector? Some of the digital solutions had been discussed for years, but it wasn't possible to adapt them on a wide scale because the relevant technology was lacking. While the internet opened up new opportunities and spurred on telehealth developments, it only became massively used after smartphones arrived around 2007. That's just 11 years ago. The other obstacle in bringing digitalization to healthcare is the sensitive data processed in this sector. Any healthcare technology has to be extremely safe and trusted, so the question of how to process the data is always a challenge. Have we managed to overcome the obstacles? Today, I think the stars are aligning, which will create a tipping point for a technology revolution in healthcare. We have accessible technology, supportive regulators and safe solutions in place. Now it's time for society at large to work out how best to use them. It's also an interesting time for investors, who can look for long-term trends as the sector advances. For which medical sectors does technology offer the biggest savings? For the sake of clarity, I would divide the sector into three areas: research and development (R&D), treatment, and efficiency. Within the R&D area, there are huge savings for so-called contract research organizations that run clinical and pre-clinical trials. In the past, a full trial cycle took around 16 years. Making the process cloud-based instead of paper-based has shortened this period substantially. Within the area of treatment, technology offers large potential cost savings through personalized medicine. New technologies allow doctors to analyze specific cases quickly – almost in real time – making it easier for them to choose the best treatment for a given patient. This can bring the treatment forward by a couple of weeks, cutting the cost of treatment itself as well as increasing the chances of a swift and full recovery. Finally, in terms of efficiency, technology helps patients to follow their treatments properly. Lack of adherence is one of the key cost drivers in healthcare systems around the world. 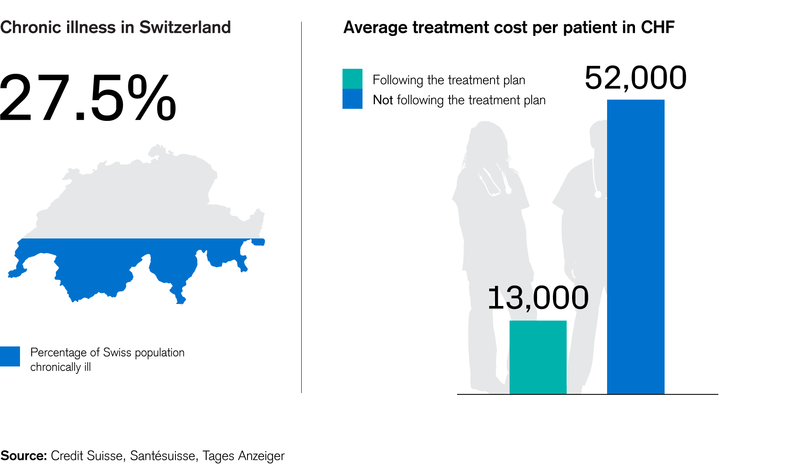 Out of eight million people living in Switzerland, 2.2 million are chronically ill. On average, the annual cost per patient is CHF 13,000, provided they follow the prescribed treatment. If patients don't follow it, the cost spikes to CHF 52,000. This is due both to the underlying disease advancing and to additional health complications. One of the main reasons people fail to follow their treatment is that they simply forget to take their medication. Today, you can use monitoring tools to remind you of your treatment schedule. This also allows doctors to track how well their patients are following their treatments and spot any lapses quickly. Apart from savings, what other benefits are there for patients and doctors in more automation and robotics in healthcare? I would summarize it in two words: convenience and safety. Convenience is mainly about the time saved thanks to things like telemedicine, as there's no need to leave home or your office for an appointment. When it comes to safety, there are two main aspects that both patients and doctors benefit from: drug therapy and precision surgery. On the one hand, automation helps us analyze huge amounts of data, highlighting potential drug interactions and speeding up diagnosis. On the other hand, robots performing operations make minimally invasive surgery possible: More precise cuts during surgery result in less blood loss, faster healing, and lower rates of post-surgery infections. Digital health should give people tools to manage their health and spot potential abnormalities before the sickness develops. In what way can digital health change functioning of the healthcare systems? At its core, digital health improves efficiency and allows patients to fully benefit from healthcare. I would argue that today's healthcare systems should be called sickcare systems as they focus on treating sicknesses instead of helping people to stay in good health. Patients only enter the system when they're already ill. Digital health should change this, giving people tools to manage their health and spot potential abnormalities at a very early stage, before the sickness develops. This would reduce cost, time and stress for doctors, patients and their families. Christian Schmid, CFA, Director, is a senior portfolio manager and lead portfolio manager of the Credit Suisse (Lux) Global Digital Health Equity Fund. Christian has been lead manager for European and global equity funds and was also responsible for active stock selection in emerging markets. The future of work: Innovation's impacts on the workforce. The current digitalization revolution has a strong adjusting impulse on our occupational skills. A key question is not if there will be jobs, but more, which professions will substantially change.